Voice 1156 presents What's Left to Ponder? 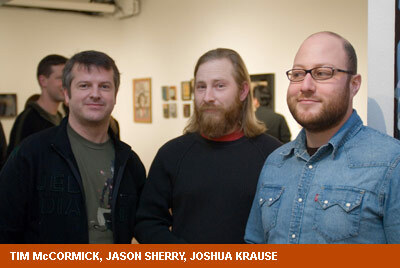 Tim McCormick, Jason Sherry, and Joshua Krause. 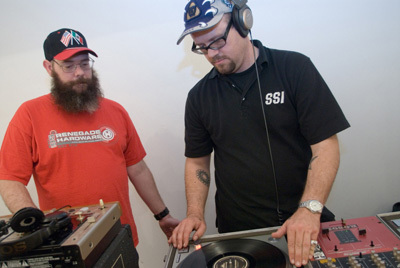 Click here to hear streaming mp3 audio of DJ Greendub's performance during the opening night reception. 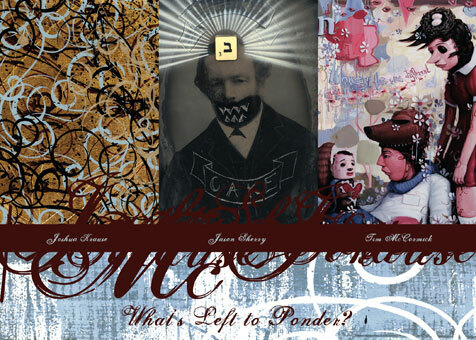 The three artists featured in “What's Left To Ponder?” all share common sentiments about the interplay of the conscious and subconscious interpretations of history, movies, myth and popculture, but not in an obvious, literal way. Their work is laden with many coded personal, historical, and filmic references that are intentionally vague, often whimsical, and somewhat critical. Each artist has their own individual obsessive nature towards their art and process, as well as their friendship with one another and their appreciation of art and art history, that brings the three together. Though each recognizes the subtle nuances and conceptualism that is essential in the art they make, there exists an equally wicked sense of humor, wit and tonguein- cheek observation that makes it all palatable. 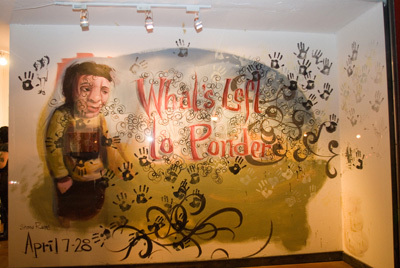 Visit the archive to view artwork and merchandise that was available during the What's Left to Ponder? show. After ten years honing his abilities as an illustrator, self-taught artist Tim McCormick, a Southern California native, began exhibiting in 2001. 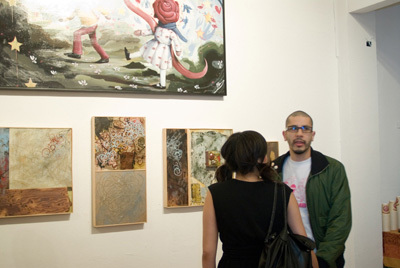 Since 2001 Tim has shown extensively in galleries on the west coast and around the country, owned 2 galleries in San Diego, and has become a standout in the Los Angeles/SoCAl art scene. Originality, skill, and wit coupled with one of the most prolific outputs of any artist anywhere Tim McCormick's reputation is moving swiftly throughout the contemporary art world. "My work is in a constant state of evolution and experimentation," Tim explains. “In spirit I've combined a type of figurative expressionism and surrealism in which every piece is improvised from a very loose plan or no plan at all." 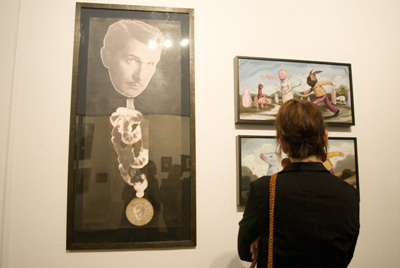 The true meaning of his pieces remain totally personal, a kind of riddle to be pondered by each viewer. Tim's work is about all aspects of life, from the most profound to the most trivial, everything is relative, everything is important. Tim brings to his work a unique perspective on issues of fame, pop culture, and self. Perceptions of suburban banality set against the surreal backdrop of Hollywood, as well as the influence of San Diego's early surf and skateboard subculture, manifest themselves in the artist's work. For the future, Tim plans to paint everyday and further explore and improve his craft and visual language, while continuing to reach out to a larger audience. Local artist Jason Sherry is a cut-and-paste whiz, creating original jarring collages from yesterday's news. Jason juxtaposes vintage black-and-white photos, graphics and propagandistic imagery with multilingual typography against bold-colored backgrounds. Jason lives and works in San Diego. 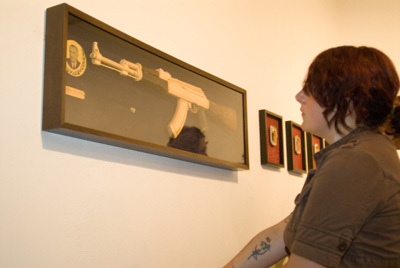 He received a bachelor's degree in fine art from San Diego State University. His work has always been set apart from the artists with whom he shows due to his distinct style and concerns of content. "I am concerned with presenting the absurdity of human history and culture by assembling disparate objects and images into new objects of great humor and meaning," explains Jason. "I love working with the tiny fragments of peoples' lives, the things people leave behind." says artist Joshua Krause. This fascination can be traced back early on in Joshua's life, who as a kid found great pleasure in picking up the tiny pieces of trash that littered his New York City block. Cigarette-butts, gum and broken bottles, the ephemera of his neighborhood streets would later become elements of Joshua's collages. From spray paint to photocopies, torn paper to charcoal, his illustrations find their way onto a versatile array of surfaces: tattered book covers, wood and canvas. His blend of text and illustration stem from a dual interest in both literature and design, aiding in the content and context to the layered backgrounds and landscapes that fill his works. Joshua explains, “The meanings and stories behind most of my work is really best inferred in the titles, and my work is very stream-ofconscious mixed with inside jokes and my reaction to being alive. I'm just really trying, now more than ever, to paint how I feel and experiment and develop. Good art to me is ultimately about revealing passion, vision and voice”. Joshua draws from a fascination of popular culture, evolution, and myth and then adds something very personal to it: his daydreams, fears, inspirations, frustrations, wit, and humor. In addition to gracing the wall of galleries throughout the US with his art work Joshua also designs clothing, CDs, DVDs, and is the art direct for a few neat companies like CameraNoise and Loud+Clear Records.